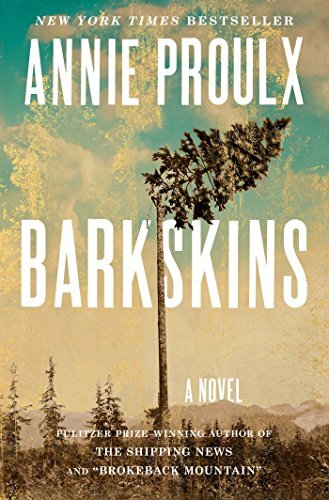 From Annie Proulx--the Pulitzer Prize-- and National Book Award--winning author of The Shipping News and "Brokeback Mountain," comes her masterwork: an epic, dazzling, violent, magnificently dramatic novel about the taking down of the world's forests. In the late seventeenth century two penniless young Frenchmen, René Sel and Charles Duquet, arrive in New France. Bound to a feudal lord, a "seigneur," for three years in exchange for land, they become wood-cutters--barkskins. René suffers extraordinary hardship, oppressed by the forest he is charged with clearing. He is forced to marry a Mi'kmaw woman and their descendants live trapped between two inimical cultures. But Duquet, crafty and ruthless, runs away from the seigneur, becomes a fur trader, then sets up a timber business. Proulx tells the stories of the descendants of Sel and Duquet over three hundred years--their travels across North America, to Europe, China, and New Zealand, under stunningly brutal conditions--the revenge of rivals, accidents, pestilence, Indian attacks, and cultural annihilation. Over and over again, they seize what they can of a presumed infinite resource, leaving the modern-day characters face to face with possible ecological collapse. Proulx's inimitable genius is her creation of characters who are so vivid--in their greed, lust, vengefulness, or their simple compassion and hope--that we follow them with fierce attention. Annie Proulx is one of the most formidable and compelling American writers, and Barkskins is her greatest novel, a magnificent marriage of history and imagination. Annie Proulx is the author of eight books, including the novel The Shipping News and the story collection Close Range. Her many honors include a Pulitzer Prize, a National Book Award, the Irish Times International Fiction Prize, and a PEN/Faulkner award. Her story "Brokeback Mountain," which originally appeared in The New Yorker, was made into an Academy Award-winning film. Her most recent novel is Barkskins. She lives in Seattle.